For a room where hundreds may be on the phone at once, it’s surprisingly serene on the floor of the US Bank Service Center in Coeur d’Alene. Seated here in a labyrinth of beige cubicles are the people on the other end of the line when you call about that credit card balance. The Inland Northwest is home to more than 20 call centers, with a total employment averaging about 3,000 this year in Kootenai and Spokane counties. While that’s down from peak years, some of the fullest employee parking lots in the region can be found at these work sites, which have weathered the economic slump fairly well and provide stable employment. This is an attractive region for call center operations, with the potential for good growth in the industry, economic development officials say. Operators like this area because the workforce has plenty of call center experience and its accent is neutral, which appeals to customers, said Robin Toth, vice president of business development for Greater Spokane Incorporated. Plus, available properties are reasonably priced, and many companies are looking to expand to the Pacific time zone, Toth said. For workers, call centers offer a variety of work shifts, opportunities to build skills and advance within the industry, and employee benefits that often don’t exist in the retail sector, she said. “So it’s actually a good starting job,” Toth said. The call center or “contact center” industry isn’t always understood or well regarded by the public. Some companies gained a bad reputation for aggressive telemarketing tactics, and others have drawn criticism for moving operations out of the United States. But call centers fill an important niche, said Steve Griffitts, president of Jobs Plus, Inc., the nonprofit economic development corporation for North Idaho. The qualified workforce was a key reason US Bank came to Coeur d’Alene, and the labor pool continues to provide the skilled workers they need, said Scott Tostengard, a vice president at the call center. “I think our reputation as being a stable employer with a positive work environment has helped us out there in the community. Stability has especially been strong for us; there’s not a concern of layoffs,” Tostengard said. In turn, the US Bank call center has a strong multiplier effect on the economy, supporting about two jobs in the community for each position there, Griffitts said. And it teaches a high level of customer service, benefiting other employers in the area, he said. The prospects for growth locally are good in 2013. Griffitts said one large company – he can’t reveal which – is looking to come into Coeur d’Alene in the new year. Likewise, Toth said she knows of three good prospects eyeing the Spokane market. Call center employment has averaged 1,700 this year in Kootenai County, down from a peak of 2,440 in 2011, according to the Idaho Department of Labor. Part of that drop happened when Center Partners seeded its new Liberty Lake contact center with 300 employees from Coeur d’Alene. 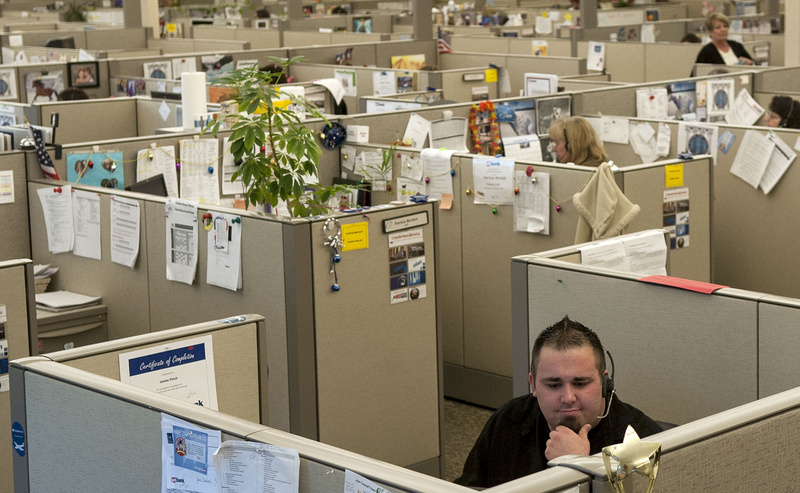 Spokane County’s call center employment peaked at 3,000 in 2005. This year employment has averaged 1,300, according to the Washington Employment Security Department. But those numbers don’t include smaller call centers within larger business operations, so the number of people working these jobs may be much higher. Nationally, the industry has been growing for four years, according to the National Association of Call Centers. U.S. airlines have brought their call center functions back to the states, but wireless companies like Verizon and T-Mobile have sent most of their call center jobs offshore, the organization said. “For as many jobs that come back, it seems a nearly equal number of jobs go offshore,” said Paul Stockford, research director for the association. American companies save a lot on labor by using call centers in the Philippines and India. But US Bank has opted to run its own call centers domestically, with locations in Fargo, N.D., and Overland Park, Kan., in addition to Coeur d’Alene. “Customers tell us how much they appreciate the fact we’re answering their calls in America. And there’s no concern about the accent, the dialect,” Tostengard said. The bank opened the 60,000-square-foot building on Seltice Way in June 2005, and by the end of 2008 it was full. About 500 employees, most of them full time, answer calls to the payments division. It’s open seven days a week, with shifts starting as early as 5 a.m. and others ending at midnight. An agent starts at a little more than $11 an hour, and benefits include medical and dental insurance, 401(k) retirement plan, vacation and holidays. Tostengard said they look for employees who are friendly and well-spoken, and who listen to the customer’s needs. New hires receive seven weeks of training, and the work can be challenging. The industry typically experiences high employee turnover, but Tostengard said turnover at the Coeur d’Alene center is the lowest he has seen in 24 years in the business. High unemployment these days contributes to that retention, but it’s not the only factor, he said. “I do think we put a lot of effort and a lot of focus on creating that environment where people want to come to work and help others, and it’s paid off,” he said. One of the area’s largest call center employers is Colorado-based Center Partners, which entered the market 12 years ago and now has 600 workers in Liberty Lake and about 1,050 between two centers in Coeur d’Alene. It contracts with other companies to handle inbound calls, such as customer support, as well as place outbound calls. The three locations here handle work for six clients, including mobile phone and television services, insurance providers and banks. “Fifteen years ago it was hard to get a job in Coeur d’Alene, so there was a readiness and an eagerness for some good jobs, which we jumped into,” said Matt Carleton, a local site director with Center Partners. The company dropped several hundred positions earlier this year but has gained them back and is growing again, he said. Starting pay is between $9 and $9.50 an hour. Center Partners doesn’t identify its clients, which contributes to an aura of anonymity that surrounds much of the call center industry. Employees are trusted to protect sensitive client and customer information. To help break down those walls, companies and employees have embraced charitable causes. Center Partners has been a top blood and platelet donor for the Inland Northwest Blood Center in the past decade, and employees contribute generously to food bank and school supplies causes. Likewise, US Bank and its employees are major supporters of the United Way of Kootenai County, and each employee is given eight hours a year to volunteer in the community. They’ve been top participants in the United Way Day of Caring. Richard Murray, president of the bank’s North Idaho region, said he only hears positive feedback in the community about the call center. “We were embraced quickly by the community, and we’ve really held up a great reputation all the way through,” he said.